Hours to the burial of his former boss, South Sudan’s acting army chief of staff, Gen. Gabriel Jok Riak was Thursday flown to Kenya, “unconscious” after he had reportedly complained of chest and stomach discomfort. It was not immediately clear what caused Riak’s condition, with the military and family sources providing conflicting accounts. Family members linked it to fatigue following days of continuous engagement without enough rest, while military sources who attended to him at the military hospital attributed the cause to food poisoning, citing complaints about stomach cramps and vomiting. President Salva Kiir Mayardit accompanied by the Country’s First Lady Mama Mary Ayen Mayardit and Senior government officials bid farewell to the casket of the Late SPLA chief of defense force Gen. James Ajongo Mawut at Juba International Airport on Thursday. Information minister and government spokesperson Hon. Michael Makuei Lueth said the body of the would be flown to Aweil state and will be buried at his home area at Bar Mayen. Hon. Makuei added that late Ajongo, who was working for the reformation of the SPLA, left a legacy behind to be remembered. Being second in the army command structure, many felt Riak would be appointed if President Salva Kiir made his pick of the new army chief from among the high ranking officers. In July 2015, the United Nations Security Council imposed travel bans and asset freezes on Riak, among other senior military officers. 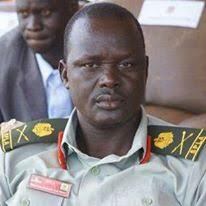 The move came after the United States Department of the Treasury’s Office of Foreign Assets Control designated for sanctions Riak, who was then commander of Sector One of the South Sudanese military.